I came across this barebones Mac setup while browsing around Flickr and found the simplicity appealing. 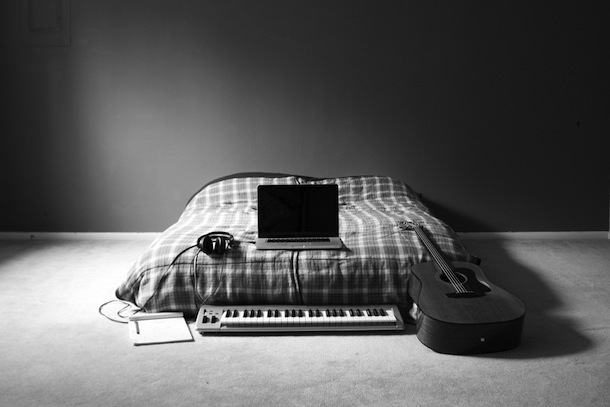 MacBook Pro, some notes, headphones, keyboard, and a guitar. What else do you need? maybe a table, a chair…. Hmmm… an MBP sitting on a soft surface… no, no, no. That’d iron your sheets and keep the bed warm as well. You’d definitely need a microphone, mic stand and usb audio interface for a start! Yep, a mic and audio interface could help, but what if the person only makes background/ backing tracks for a living…and his notepad is for drawing flow charts to help flesh out various tracks?